New year, new you! Did you make a new year's resolution to be more eco-friendly or perhaps to add more exercise to your daily routine? Fear not as goDCgo has some tips to help you reach both goals! DC has plenty of transportation options – including Metrorail, lots of buses, biking, walking, teleworking, etc. – to choose from and avoid driving into or within the District altogether. You could even switch it up by sharing a ride or scooting! Either way, we've got you covered with the best ways to commute in the District. There is no shortage of commute options for you to try in the DC area. 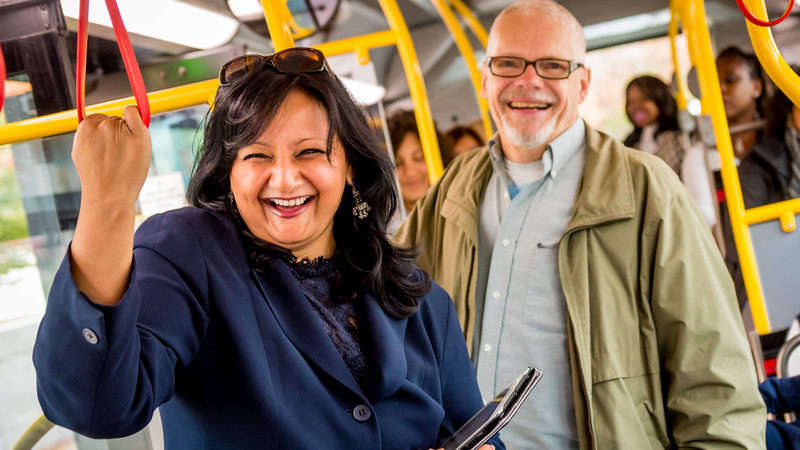 Bus: The metro DC area offers a robust network of local and regional bus options to get you to and around the city. In fact, two-thirds of commuters in the area live less than one mile away from a bus stop. When you choose to walk to your local bus stop to commute to work, you will be adding some extra steps to your day. To plan your trip, visit our bus resources page. Train: The DC area has several train options, including Metrorail, DC Streetcar, MARC, VRE, and Amtrak. By choosing to commute by rail, you will have more time in your day to catch up on work or do something fun like read a book instead of fighting traffic—this can ultimately reduce your stress level. Plus, if you live close enough to the train station to either walk or bike, you can incorporate your fitness routine into your commute. Find maps, apps, and other tools to help you plan your trips by rail. Biking: Did you know that 4.9% of DC residents bike to work every day? Join these residents to save money and improve your health by adding more exercise to your routine. If you don’t have your own bike, you can rent one through Capital Bikeshare; it has over 500 stations and more than 4,300 bikes across six jurisdictions. Now, Capital Bikeshare has upped the ante by adding 80 e-bikes to its system. The new e-bikes, known as Capital Bikeshare Plus are all black and available for rent through the kiosk or through the CaBi app. Additionally, dockless bikes and scooters are available to rent from multiple companies. Explore all the bike-friendliness in Washington by downloading the DC Bike Map. Walking: Did you know DC is the 7th most walkable city in the nation with 13.2% of commuters walking to work? You can walk 1,000 steps in around 10 minutes. So if you are looking to boost your fitness in the new year, try adding some more walking to your commute and daily routine around town. Take advantage of the region’s incredible pedestrian network by tapping into the maps and other tools. Rideshare: Fewer cars on the road means lower emissions and less stress for you. Share the ride through carpooling or vanpooling by connecting with co-workers or logging into Commuter Connections or the CarpoolNow app. Consider borrowing a vehicle using a carsharing service like car2go, Zipcar, or Maven. You can also participate in a slugline, which is an easy, informal way to carpool and take advantage of I-395/I-95 and I-66 HOV lanes between Northern Virginia and Washington. You can wait in line at designated pick-up locations to catch a carpool to a drop-off point. The DC metro area has over 30 slugline locations. Teleworking: Talk to your supervisor or human resources department to check whether your company already offers a telework program. If your company doesn’t have a program in place, advocate for one. goDCgo’s Employer Services team can help walk your employer through the setup process. Which New Commute Options Will You Try? We want to know how you choose to commute smarter in 2019. Follow us on Facebook and Twitter and use hashtag #goDCgo with your 2019 transportation goals. We can’t wait to hear from you!